What will you see on the Kazinga boat ride? Have you been to Uganda? Have you ever done a boat safari? 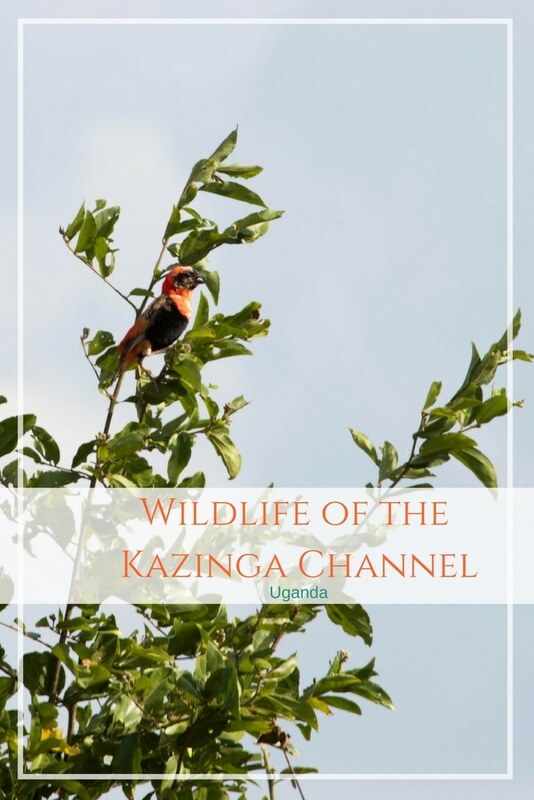 Put the Kazinga Channel on your bucket list today! If you have ever been to Africa, somewhere near a river, you know to take the boat cruise that you are inevitably going to be offered. It’s a given. Why? One animal. Hippos! You can sometimes see hippos outside of the water, but if you want to make sure to see them you book that cruise! 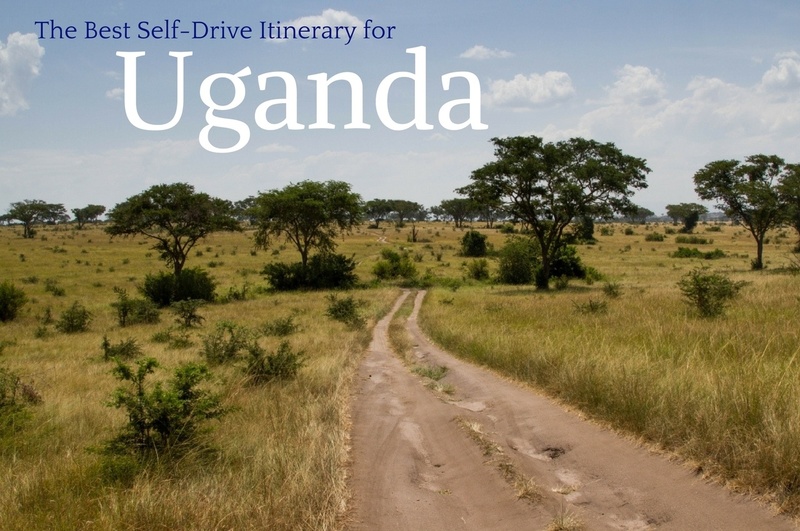 These were our thoughts, as we were making our Uganda to-do list. There’s a boat ride in Queen Elizabeth park? How much is the Kazinga Channel cruise? $30? No question, we’re going to do it. Spoiler alert! We saw hippos! Lots of hippos! We saw so many hippos, we couldn’t even begin to count them. But, that’s not all we saw. Cruising the Kazinga Channel in one of the two Uganda Wildlife Authority boats in Queen Elizabeth National Park served up much, much more. Here’s how our amazing day went. When we first arrived at the park, we stopped at the park headquarters to sign up for the few activities,, and the very first one was the boat cruise. 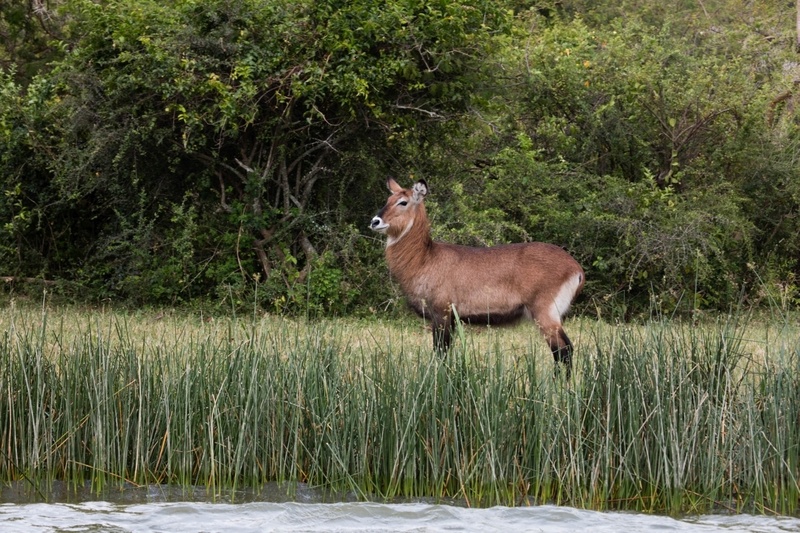 We have boated in Chobe National Park in Botswana….incredible! Then we took a mokoro boat trip on the Okavanga Delta…inspirational! So, our number one tip or rule is never, ever, pass up a safari boat cruise. Ever! There are only two boats, running twice a day throughout the year, so you need to reserve your seat as soon as you get to the park. If you are going on a guided trip through Uganda, be sure and tell your tour company you want to take the boat trip on the Kazinga Channel, and they will make the arrangements for you. 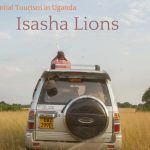 Don’t delay, this is one of the most popular excursions in Uganda. The park ranger got us signed up for Christmas Day, which was perfect, because we knew we would have a great day. We showed up at the park ranger’s office nearest the dock and picked up our tickets, then headed down to the dock. It was a scorcher of a day, and there wasn’t much shade. We followed some folks and a bunch of people were waiting in a gazebo. We joined them. Everyone was friendly, laughing at the kids playing, just becoming a community waiting for the earlier boats to return. However when they did, watch out! It was each for himself. We got down to the dock second behind a French family, but there was so much shoving and jostling that the family never ended up on the boat, and we only just grabbed the last two seats. It was crazy. We learned almost a tad too slowly how to just elbow our way to the gangplank. Once we were seated and the last few people joined the group, we were off. First we were introduced to our small crew, the captain, the one deck hand, and Lucy our guide. She was so much fun to listen to. She almost never took a breath, and kept telling us all the facts and figures about the park and specifically the Kazinga Channel as well as about all the animals, birds, and even some of the plants we would be viewing. Right away the captain whisked us across the water, and there on the other side from the dock, we were met with crocodiles, hippos, cape buffalo, and elephants. They were either cooling off in the water, getting a drink, or just spending the day at the beach like we humans like to do. The captain was good, too. He kept turning the boat so that both sides had plenty of easy viewing time and great angles for photo-taking. I couldn’t get enough. After about 20 minutes of this, we finally pushed off and moved down the channel where we saw monitor lizards, spoonbills, cranes, hammerkopf birds, warthogs, antelope, more and more birds, so many hippos, and one small, curious snake that later we thought had to be a black cobra. 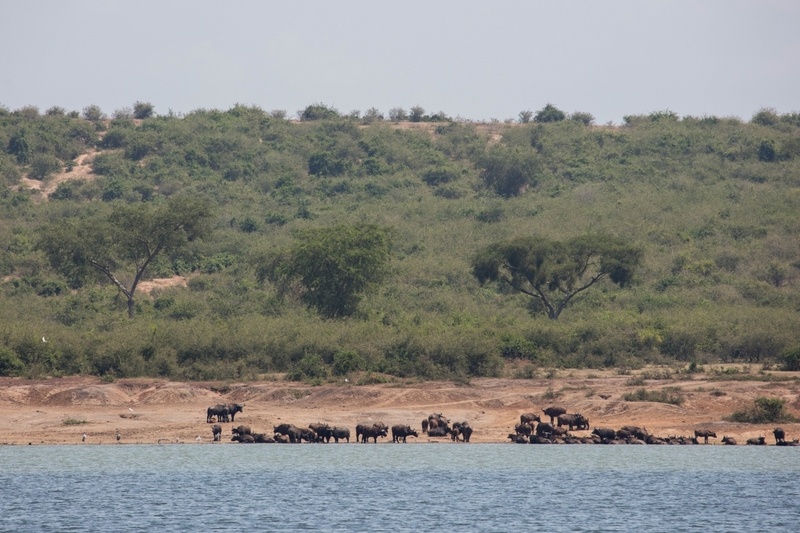 The Kazinga Channel was teeming with every kind of animal you would expect to see and more. The animals don’t feel threatened by the boat. They may pay attention to what you are doing, but they don’t run away. Further along, there was also a fishing village where the locals were readying to go out. They fish at night from the small, wooden boats. They, too, were all business and really didn’t pay us any mind either. It looked like they were all in for a hard night, when, to make matters worse it started pouring rain. Inside the covered boat, we were all getting soaked, because the wind was so strong. We didn’t mind, though, as this brought the temperature down and cooled us off. I really felt for the poor fisherman, however, who were not going to turn around and miss a day’s work. We all huddled together for the ride back to the boat dock, but the rain didn’t dampen our spirits one bit. We were so excited to have had such an amazing boat cruise. I would say it was one of, if not the best, activity we did during our entire Uganda safari experience. 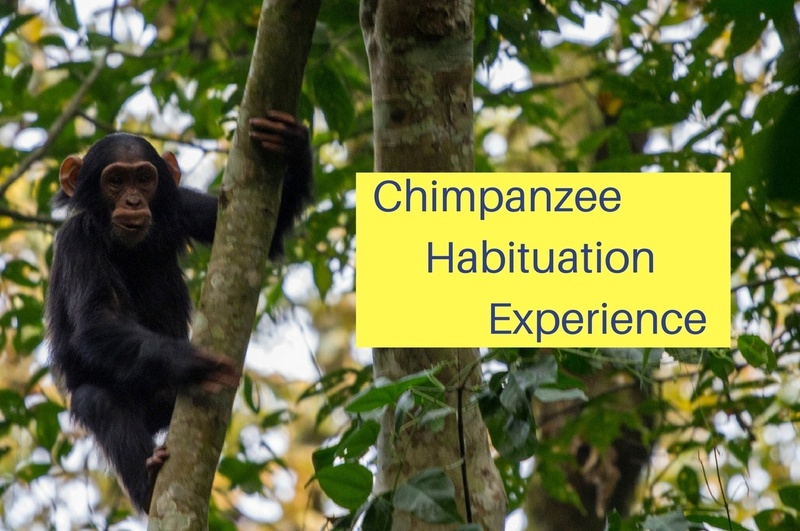 It certainly ranked right up there with gorilla tracking in Biwindi and the chimpanzee habituation trek in Kibale. Save Boat Cruise Kazinga so you won’t forget! Wow, this looks like an amazing experience. Africa is on my bucket list. I would love to see all these animals. Barb, I’m sure you’ll get there, and you will love it! One day I will get to Africa. I have such a love for animals and the African animals are just amazing. The cost of this trip too – how amazing !!! Incredible experience and one that you will no doubt remember for a lifetime. Kerri, I’m sure you will. Africa is amazing. We keep going back. What an amazing experience! 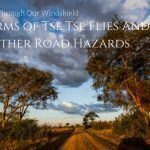 We just got back from Kruger National Park and the Zambezi River and had the BEST time! A river cruise sounds amazing. Kam, I really am a huge fan of safaris. I love seeing the animals in their natural habitat. Your family would love the boat safari, I’m sure. Wow, now we really want to do this trip! Next month we are going to Uganda with our 2 children. Where did you book the trip? Where did the boat leave? I also read about the boattrip from Mweya safari lodge. Is this the same boattrip?? We booked our trip at the HQ building right at the park, we asked our car hire if they could arrange it beforehand but were told it has to be done at the park. The Mweya Safari Lodge has there own boat but it is the same route. Either way, this is a must do when in Queen Elizabeth Park. I did a four week safari with Dragoman Safaris in 1990. We went to the Kazinga channel and it was awesome!! The best part of the safari was going to Mgahinga Gorilla Park in southern Uganda. We spent an hour with mountain Gorillas!!! Unbelievable is putting it mildly. Make time to do the Safari as it will be an unforgettable adventure! Be carefull as hippo’s kill more tourists in Africa than any other animal. They are extremely territorial and aggresive. Albert, It’s so true. Hippos are scary and safaris…are amazing! 10+ Eastern European Capitals That No One Thinks To Visit - So Go Now!